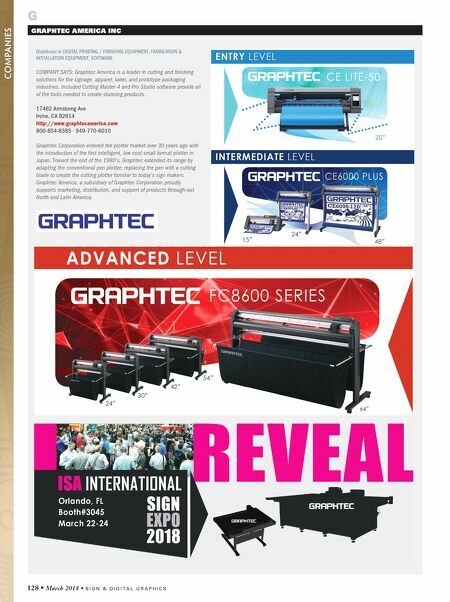 S I G N & D I G I T A L G R A P H I C S • March 2018 • 129 GSG Distributor in AWNING SYSTEMS / SUPPLIES / EXTRUSIONS, BANNER MATERIAL & SUPPLIES, CHANNEL LETTER SYSTEMS, DIGITAL PRINTING / FINISHING EQUIPMENT, DIGITAL PRINTING INKS, DIGITAL PRINTING MISC, ELECTRONIC SIGNAGE (LED / NEON), FABRICATION & INSTALLATION EQUIPMENT, FILMS, FINANCING / LEASING SERVICES, MEDIA / LAMINATES, SCREEN PRINTING EQUIPMENT / SUPPLIES, SIGN & WRAP SHOP TOOLS / SUPPLIES, SIGN COMPONENTS / HARDWARE, SIGNAGE DISPLAY / EXHIBIT SYSTEMS, SOFTWARE, SUBLIMATION EQUIPMENT / SUPPLIES, TRAINING / EDUCATION COMPANY SAYS: GSG is a wholesale distributor of consumable supplies and equipment for the electrical sign, commercial sign, digital printing, and apparel decorating markets. For more information visit www.GoGSG.com or email marketing@gogsg.com. 4601 Spring Valley Rd Dallas, TX 75244 http://www.gogsg.com 800-366-1776 ∙ 214-748-3271 GTI GRAPHIC TECHNOLOGY INC Manufacturer in SIGN & WRAP SHOP TOOLS / SUPPLIES, SOFTWARE COMPANY SAYS: GTI is the leading manufacturer of tight-tolerance lighting systems for color viewing and assessment. Our products include tabletop, floor stand, and large-format viewing systems. All products are manufactured at our facility in Newburgh, New York. 211 Dupont Ave PO Box 3138 Newburgh, NY 12250 http://www.gtilite.com 845-562-7066 SEE GYFORD STANDOFF SYSTEMS' LISTING BELOW GRIMCO INC Manufacturer/Distributor in AWNING SYSTEMS / SUPPLIES / EXTRUSIONS, BANNER MATERIAL & SUPPLIES, CHANNEL LETTER SYSTEMS, DIGITAL PRINTING / FINISHING EQUIPMENT, DIGITAL PRINTING INKS, DIGITAL PRINTING MISC, ELECTRONIC DIGITAL SIGNAGE, ELECTRONIC SIGNAGE (LED / NEON), FABRICATION & INSTALLATION EQUIPMENT, MEDIA / LAMINATES, SIGN & WRAP SHOP TOOLS / SUPPLIES, SIGN COMPONENTS / HARDWARE, SIGNAGE DISPLAY / EXHIBIT SYSTEMS, SOFTWARE, SUBLIMATION EQUIPMENT / SUPPLIES, WHOLESALE - (TRADE ONLY) COMPANY SAYS: Trusted value and service since 1875. Grimco is a wholesale sign supply company with locations across the U.S.A. and Canada. We focus on distributing quality products to the sign industry. 1585 Fencorp Dr Fenton, MO 63026 http://www.grimco.com 800-542-9941 GSC IMAGING LLC Manufacturer in DIGITAL PRINTING INKS COMPANY SAYS: GSC Imaging is a leading developer and manufacturer of premium digital ink. We specialize in making water-based inks for the aftermarket and for OEM printers. We also make industrial inks, mailing inks and inks for other specialty applications. 50 Buchanan St La Vergne, TN 37086 http://www.gscimaging.com 856-745-2398 G GYFORD STANDOFF SYSTEMS Manufacturer in ARCHITECTURAL & STOCK SIGNS, BANNER MATERIAL & SUPPLIES, FABRICATION & INSTALLATION EQUIPMENT, SIGN COMPONENTS / HARDWARE, SIGNAGE DISPLAY / EXHIBIT SYSTEMS COMPANY SAYS: Gyford StandOff Systems designs and manufactures precision aluminum and stainless steel mounting hardware. Create unique signage with rod, wire and StandOff systems. 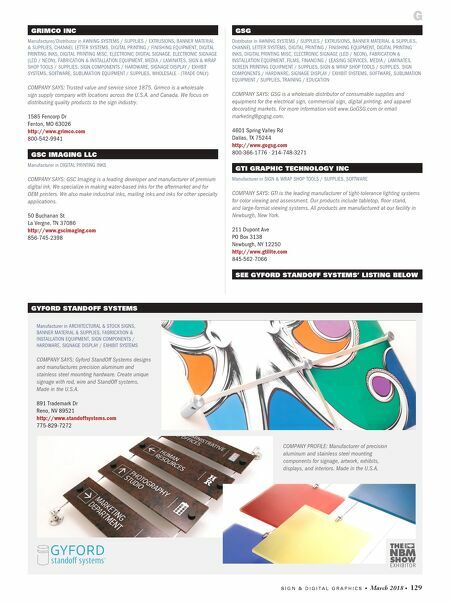 Made in the U.S.A. 891 Trademark Dr Reno, NV 89521 http://www.standoffsystems.com 775-829-7272 COMPANY PROFILE: Manufacturer of precision aluminum and stainless steel mounting components for signage, artwork, exhibits, displays, and interiors. Made in the U.S.A.